CultureStrike's Visions from the Inside project asked artists to illustrate letters from detained migrant families. Courtesy Robert Trujillo Local artist Robert Trujillo (work pictured above) is one of fifteen contributors to Visions from the Inside. Miguel is ten years old. He is currently being held at a for-profit detention center in Karnes County, Texas, presumably because his family attempted to cross the US-Mexico border without permission. From the outside, it's difficult to know much more about Miguel's life. To most people, he's invisible. But organizers at CultureStrike, a national pro-migrant arts organization based in downtown Oakland, are working with artists from all over the country to change that. Attorneys working with End Family Detention, an organization that advocates for detained migrant families, are in contact with Miguel through letters. To raise awareness about the people being held inside detention centers and the conditions they're experiencing, End Family publishes detainees' letters online. Miguel's reads: "They go through our drawers just like a prisoner. Sometimes they treat us with kindness, but other times they don't treat us well ... In the beginning you eat the food, but later you don't anymore, because it's always the same." Many Americans don't think about the existence of immigration detention centers, or the fact that most of them are owned by private companies, such as Corrections Corporation of America and the GEO Group, Inc. According to CultureStrike, the last few years have seen a surge in Central American families attempting to flee violence in their home countries by seeking refuge in the United States. But those who make it to the border often get detained, with little or no legal counsel, until immigration officials determine whether they will be deported. At the beginning of this year, organizers at CultureStrike visited a detention center in Arizona, much like the one that Miguel is being held in. CultureStrike's artist program manager, Julio Salgado, was among the group. He was immediately struck by the detainee's reliance on letter-writing, a medium that seemed unfairly archaic and inefficient in today's world of fast-paced communication. "For folks who are in detention, writing letters is so necessary," said Salgado in a recent interview. "It's the one thing that they can use to communicate with organizations that will help them with their cases." While visiting, Salgado learned about End Family Detention, and realized that he could bring extra attention to the letters they were posting by pairing artists with the authors to create illustrated versions. Thus, the project Visions from the Inside came to be. Salgado handpicked fifteen artists from all over the country and sent each one a link to a letter. The artists were asked to provide a mock-up of an illustration inspired by the letter and a paragraph about their approach to interpreting it, which was then sent to the detainees through an attorney and returned with feedback. For the past two weeks, CultureStrike has been releasing one illustration a day on the project website (VisionsFromTheInside.Tumblr.com), with an artist statement, an excerpt from the letter, and a link to the full, scanned version of the handwritten note. By August 14, all fifteen illustrations will be available online. The goal is to force people to recognize the prison-like conditions of detention centers, and to see migrants as people, not numbers. "You can't believe that this is happening in our own backyard, and a lot of people have no idea that this happening," said Salgado. Artist Robert Trujillo, an Oakland native, was paired with Miguel for the project. 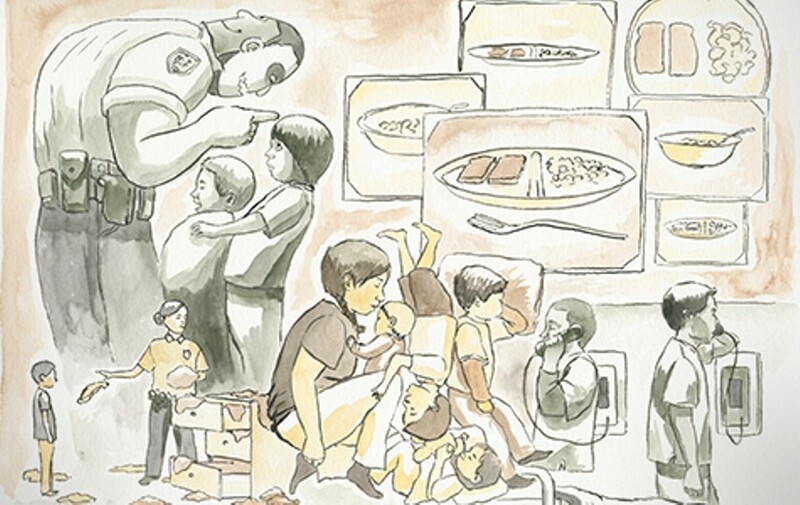 His illustration is packed with imagery: a two-faced guard, children cramped into a small sleeping space, overlapping trays of unappetizing food, and rows of prison-like garments. He hoped to evoke the letter's sense of entrapment and loss of autonomy in a visually captivating way. "As a visual artist, you're in a visual war against people who are putting out propaganda, people who are putting up misinformation, people who are regurgitating what's been said to them," he said. "So when you come to [audiences] with an image that contradicts that ... it has to be done in a clever, eye-catching way." Salgado also stressed that the project is not only about sharing stories, it's also about using those stories to counter the dominant narrative around migration. At a time when prominent figures such as Donald Trump are referring to undocumented immigrants as rapists and criminals, combating those perspectives is especially vital, Salgado pointed out. "If we don't counter that with images, with our stories, even with movies — wherever people get culture — it's always going to be that way." While Trujillo was paired with a child, many of the other artists, including Berkeley artist Micah Bazant, were paired with mothers. Bazant's piece depicts a detained mother surrounded by illustrations that allude to a long history of violent colonization. Because media discourse about migrants rarely ventures beyond their arrival in the United States, Bazant's piece is an attempt to honor that historical context and view the author's story in a way that doesn't emerge from a North-American perspective. Salgado required all of the artists involved to engage in an educational session about migration issues and detention centers at the beginning of the project. He wanted to ensure that all the artists were informed about the realities of migrant detainment, to make sure that the work was a collaboration that showcased the stories of the detainees rather than co-opted them for a personal creative vision. "I really encouraged the artists to think about the journey of the mothers in terms of what it takes to make that trip, what it takes to pick up your life and go to another country in order to escape whatever you're escaping from in your own country," said Salgado. "In a lot of cases, we feel sorry for the mothers, but in reality, they're fighting back from detention, they're writing those letters. ... They have their stories."